Council Leader Neil Bannister helps out at the Grow on Space site. Harborough District Council’s Grow on Space project – due to open at the end of 2019 – will see the development of a new commercial building that would provide office space for businesses looking to grow and move into larger accommodation in the district. 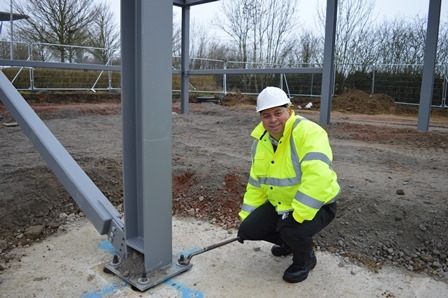 Council Leader Neil Bannister and Harborough District Council joint chief executives Norman Proudfoot and Beverley Jolly visited the site, at Compass Point Business Park in Market Harborough, to see how the project was progressing.